Time Value Principle 1: Cash flows at different points in time cannot be compared and aggregated (i.e. added). All cash flows have to be brought to the same point in time before comparisons and aggregations can be made. We will consider working out PVs of five types of cash flows – simple cash flows, annuities, growing annuities, perpetuities and growing perpetuities. Where, CFt = the cash flow at time t. This cash flow can be discounted back to the present using a discount rate. Concurrently, cash flows in the present can be compounded to arrive at an expected future cash flow. This makes Choice A better and more desirable. Please note that for discounting (to get the PV) we have used the same formula used for compounding and getting the future value an amount lent today. Where ; CF0 = Cash Flow now and r = Discount rate . Again, the compounding effect increases with both the discount rate and the compounding period. In a pinch, the rule of 72 provides an approximate answer the question “How quickly will this amount double in value?” by dividing 72 by the interest rate; thus, a cash flow growing at 6% a year will double in value in approximately 12 years, while a cash flow growing at 9% will double in value in approximately 8 years. As compounding becomes more frequent, the EAR rate increases, and the PV of future cash flows decreases. 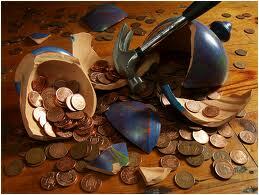 An annuity is a constant cash flow that occurs at regular intervals for a fixed period of time. Defining A to be the annuity. An annuity can occur at the end of each period, as in the time line shown below or at the beginning of each period. Assume again that you are the owner of Vashisoft, and that you have a choice of buying a copier for 150,000 cash down or paying 50,000 a year for 5 years for the same copier. If the opportunity cost is 12%, which would you rather do? The present value of the installment payments exceeds the cash-down price; therefore, you would want to pay Rs 1,50,000 in cash now. Alternatively, the present value could have been estimated by discounting each of the cash flows back to the present and aggregating the present values. The present values of the second and third annuities can be estimated in two steps. First, the standard present value of the annuity is computed over the period that the annuity is received. Second, that present value is brought back to the present. 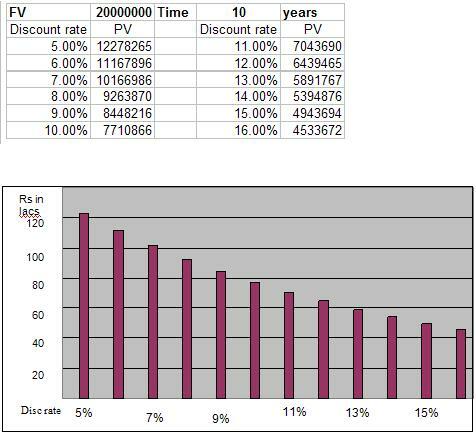 Thus, for the second annuity, the present value of Rs 300 crores each year for 5 years is computed to be Rs1,137 crores; this present value is really as at the end of the fifth year. It is discounted back 5 more years to arrive at today’s present value which is Rs 706 crores. This monthly payment is an increasing function of interest rates. When interest rates drop, homeowners usually have a choice of refinancing, though there is an up-front cost to doing so. We examine the question of whether or not to refinance later in this lesson. Suppose you are saving every month Rs 17,000 in your provident fund account which pays 8.5% interest every half year. How much would your fund make after 30 years when you plan to retire? The company would need to set aside Rs 6.9 crores at the end of each year to ensure that there are enough funds (Rs 100 crores) to retire the bonds at maturity.